It is important to know how to clean the ears correctly to reduce the risk of infections. Knowing the structure of the ear we will understand how we must clean them without hurting the dog. The hearing conduct is not straight; therefore it will not be useful to introduce a stick vertically, since it will not pass even if we try. 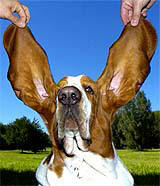 It is not necessary to clean the dog's ears daily. It is enough if we do this once a week. The dogs that have saggy ears can have the exterior part of their ears cleaned daily; we will use this in order to check that no small thorns have gone inside. The use of small sticks will be limited to the exterior part of the ear and we will not use them to clean the hearing conducts because we will push the dirt back in there. In order to clean the inside of the ear we will use a special lotion for dogs. Generally it is applied with drop counters, which are delicately introduced into the ear. In dogs with floppy ears we must hold the counters vertically. Once the drops have been introduced, we will massage the base of the ears so that the product penetrates dissolving the impurities located at the end of the conduct. Then, with a piece of cotton we will eliminate the left over liquid carefully. The Infections: The regular care of the ears will allow us to detect a possible infection rapidly. When we clean the dog's ears, it will not feel any pain and the cotton must end up relatively clean. If this is not the case, we are probably facing an ear infection. In normal conditions the ear wax must be either white or yellowish. If it is black this can be because of a parasite otitis, and if it is yellow and smells bad it can be another infection. Plucking the Ears: In determined breeds it is convenient to pluck the entrance to the hearing conduct, since the hairs can prevent the right amount of ventilation. This operation can be performed with our fingers or a pair of tweezers. We can also shave the entrance of the conduct with an electric razor.